Several well-known developers including Del Webb, Lennar, K. Hovnanian, and Toll Brothers build Virginia s active adult communities. Though Virginia does not have the sprawling 10,000+ home communities found in some popular retirement states, there are many mid-sized communities that feature a wide variety of amenities in country club settings. Indoor and outdoor swimming pools, state-of-the-art fitness centers and tennis facilities are commonly found at many communities. Many of Virginia s active adult communities are located within easy distance of the state s major metropolitan areas. A few of Virginia s most well known and most populated areas include Northern Virginia, Fredericksburg, Richmond and Virginia Beach. Whether choosing to live in Northern Virginia or the state s central or coastal regions, there are many options when it comes to active adult living. Virginia s relatively mild winters and hot summers appeal to many active adults, as does its proximity to urban centers, beaches, mountains and rural communities. Though Virginia is a southern state, its temperate climate lets residents experience all four seasons. Winters are generally mild, however occasional snow is common, particularly in the north. During some years, snowfall can be heavy, such as the 2009-2010 winter snowstorms, which buried large portions of the state under several feet of snow. However, that much snow accumulation is uncommon. Virginia summers are hot and humid with temperatures routinely reaching the high 90s. Summers can also receive heavy rainfall, particularly along the coast as hurricanes break up and travel northward. The spring and fall seasons are beautiful, though spring often quickly gives way to the heat of summer. 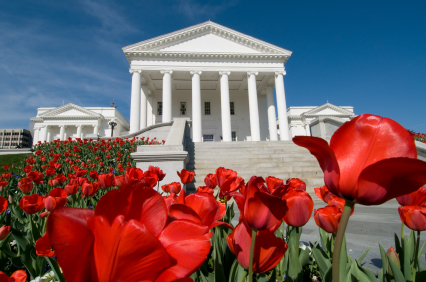 The state of Virginia is comprised of many distinct regions. There are urban centers and rural areas; there are beaches, mountains, vineyards, forests and rolling hills. Geographically, Virginia is divided into five regions from east to west: Tidewater (coastal plains), Piedmont (foothills), The Blue Ridge Mountains (Appalachian mountain range), Ridge and Valley (west of the mountains), and the Cumberland or Appalachian Plateau (southwest corner under West Virginia). As one of the country s first states, Virginia has a rich history. Civil War battlefields, historic homes, museums and historic shopping districts are common throughout the state. Many cities have nearby Old Town district where historic buildings have been restored and converted into unique shops, galleries, museums and restaurants. These historic districts often have their own seasonal festivals and community events. Old Town Alexandria, which is set on the Potomac River just outside of Washington D.C., is just one of Virginia s thriving districts which has embraced the old (including Robert E. Lee s boyhood home) and merged the new (as with the Torpedo Factory turned art studio). Farther west, Virginia offers a variety of local vineyards. Many of these wineries offer tours and tastings, as well as seasonal festivals. In Virginia s Blue Ridge Mountains, residents can enjoy natural wonders throughout the Shenandoah National Park, including the beauty found along Skyline Drive, and even explore the spectacular underground caves at Luray Caverns. For a walk back in time, residents and visitors can also spend a day at the world-famous Colonial Williamsburg. Like most states, the cost of living varies by region. The cost of living in Northern Virginia is higher than many other parts of the country, while other parts of the state are less expensive. Expenses like gas and groceries contribute to the cost of living and vary by region as well. In terms of taxes, the state collects a personal income tax, sales tax, and food tax. The property tax is set and collected at a local level, which varies throughout Virginia. Social Security benefits are not taxed and real estate is assessed at 100 percent of fair market value. In 2011, Virginia was ranked as the 20th overall healthiest state according to United Health Foundation. There are 89 hospitals throughout the state. Some of the most prominent hospitals are Inova Fairfax Hospital, which is the largest hospital in the Washington Metropolitan Area, and the VCU Medical Center located at Virginia Commonwealth University. Virginia s ratio of primary care physician to resident is ranked the 16th highest in the nation with 127 doctors per 10,000 residents.